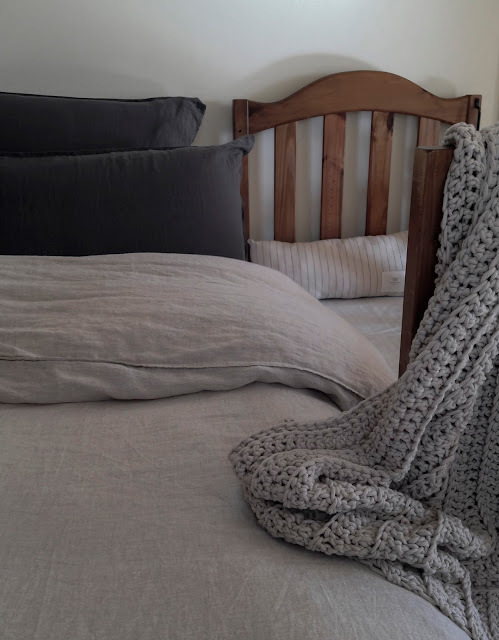 loved handmade: on getting sleep..our co-sleeping revelation! on getting sleep..our co-sleeping revelation! After four children we've finally figured it out! The whole sleep thing. Well, we've figured it out for now. Admittedly, all four of our kids have been very different to manage when it came to sleep time. We've never really had a consistent routine that has worked on going. We would do whatever it took to get sleep, and then we'd change it up pretty much however was dictated by each child. Apart from when they were newborn, the boys never really wanted to be in our bed. They'd wriggle and squirm and really just wanted their own space..but with us in it, a bit of a dilemma which ultimately left us all very much sleep deprived for a very long time. We did control crying with the first two. It was very challenging with number one. Long, long nights, but we felt it worked for us at the time. It gave us a sense of control and some structure. With number two it worked a treat, and only took us a week to have him happily settling in his own bed and for the most part, sleeping through. Number three was different altogether. Nothing ever, EVER worked with him. He was years of night terrors, and middle of the night tantrums. Nothing would work twice. When something went well one night, it wouldn't the next. With this one, it was just a matter of waiting it out and managing it one night at a time..for 6 years. For some reason, control crying was never an option for Olive. I just couldn't bare to hear her cry when all she wanted was me. To nuzzle into my nook and be close as can be. I look back and I don't know how I did it with the first two. She started off the best sleeper of all, a dream newborn giving me 5 hours sleep and sometimes sleeping through the night. Which at the time was a godsend and just what we needed having just started our business. Of course all good things come to an end and by 7 months she was unsettled and just had to be on me. I didn't care. I loved having her there and so did Nick, feeling her close and hearing her soft breath beside us. If this meant we could catch snippets of sleep here and there, then that's what we did. Gradually, over the next 18months, there was very little sleep being had by Nick and I. The only one thriving from this co-sleeping situation was the baby, and something had to give. I wanted her here with me if here is where she needs to be, but in reality it just wasn't working. We could not go on like this. I kept thinking, if only I could rig up a bed beside us somehow? I considered moving her cot into our room, but the thing was, she'd happily go down at bedtime in her own room, so I didn't want to change that. Inevitably she always ended up in our bed with all the pinching and the squirming and the sudden kicking of Nick in unfortunate places..
Then one day I saw a cot for free on our local 'Buy, Sell, Swap' page. All the lights and bells went off in my mind. I'd found the answer! We were lucky, the cot was in perfect condition, but with a thorough clean to satisfy any germ-o-phobia it was ready to set up. Right. Next. To. Our. Bed. I left a side off so that I have the cot pushed up next to the mattress. I can easily reach across and give her a re-assuring pat, and she can see me right there beside her. The first night wasn't easy. She was there beside me, in the cot, begging to be kissed and hugged and held. Although it was hard, I kept lying her back down, reassuring her it was ok. Eventually, she grabbed hold of my arm and held it sooo tight. Then she slept. The next night she slept through in her own room! All night. The third night she woke and came into our room, lying there in the cot, peaking up every now and then to check we were there and sometimes to hold my hand. Since then, I've lost count on how many nights she has slept in her own room all night. She still wakes and calls out to me but often just self settles and goes back to sleep. On the nights she does come in, she is happy to just be there, near us. After all these years, this was all we needed to do. Well, maybe. Who's to say it would have worked with the others? But it's working (for) now and that is all I need to know. Wow! What a blessing! Oh, the bliss of getting all our sleep while still comforting and loving our little ones, right? Very nice.